In the United Sates, we have the Second Amendment to our Constitution (for which this organization is named), which expressly protects the right of our citizens to “Keep and Bear Arms” because of the obvious need for defense. Our Supreme Court has repeatedly ruled that the Second Amendment applies to an individual’s right of defense, not a collective one of any organization or government controlled entity. Over the past 30 years we have seen a massive evolution in the United States, with a dramatic increase in the number of people who can, and do, legally carry defensive firearms in the public space. Over 10% of the population currently could be carrying defensive firearms (concealed) legally with permits, as residents of States that do not require a permit or as off-duty police officers. Tens of Millions more may carry firearms openly in the public space. 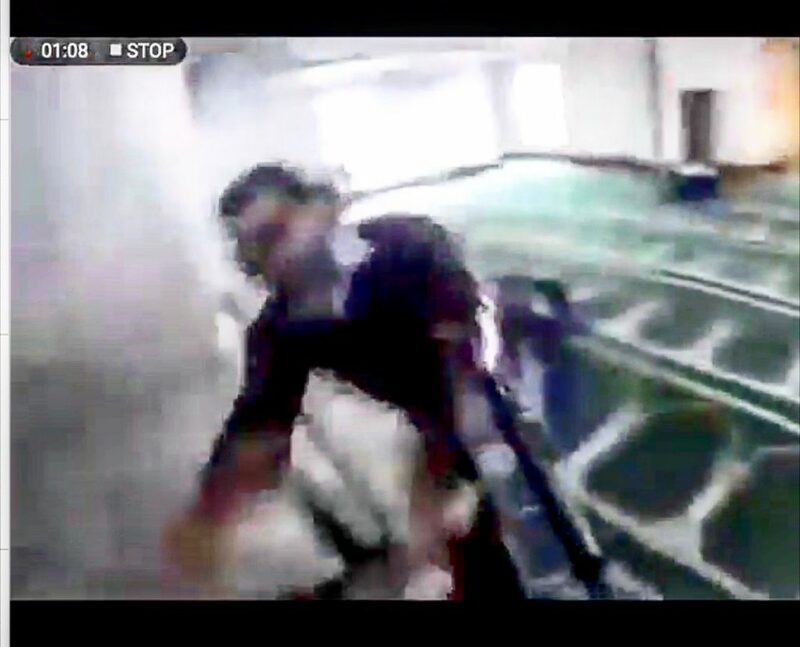 In this blurred frame from the the killer’s POV Camera, we see a victim of the attacks who appears to be lunging at the killer. We have to ask if that man, and dozens of others, may have survived if had been carrying a defensive firearm and was trained in its use. It should be noted that another unarmed man did successfully fight back and wrestle a firearm from the killer, apparently ending the murderous rampage at a second location… only after many others were dead or wounded after the brave man in this picture was shot at point blank range. In other places around the world, humans do not have similarly clear and strong protection around their right to own firearms for defense. In fact, the vast majority of our planet’s population is expressly prohibited from owning firearms for the purpose of defense. So it has been for a long time in New Zealand, the site of the recent mass killing by a lone gunman with firearms. As far as we know, the firearms were legally owned. The flaw here is clear to us: A deranged criminal who didn’t care about the intent of the laws in NZ acquired firearms and killed many people with them. We will never know how many of those people, others who were injured in the attack or others who witnessed the attacks might HAVE had a firearm with them and been prepared to stop the attack had they been legally allowed to acquire, practice with and carry defensive firearms. It is also worth noting that the killer clearly expressed that he chose to use firearms knowing that it would likely motivate governments to further restrict individual firearms rights. The meeting that the Prime Minister and her Cabinet should be having tomorrow should be to discuss how to put a system in place that will allow NZ Citizens an option to be prepared to efficiently exercise their Human Right to Self Defense with a firearm if they chose to. The attack in Christchurch last week, attacks in France over the last few years, the attack in a California bar last week and scores of other examples around the world show that no amount of Gun Control Law or Firearms Restrictions placed upon law abiding citizens will prevent motivated killers from attacking, and succeeding. Governments can’t pretend to be capable of protecting citizens from close quarters personal violence… it is a crime and a human rights violation to work to prevent them form being able to do so themselves. Sadly, New Zealand Gun Laws are quite possibly going to move in that direction very soon. The killings have added fuel to the pro-control movement in the United States as well… in alignment with the expectations and desire of the killer himself.